U.S. Secretary of Agriculture Tom Vilsack mistakenly announced yesterday that the Biomass Crop Assistance Program final rule would be published in the Federal Register today. The rule will be on public display today and will be published on Oct. 27. The USDA’s National Biofuels Strategy should focus just as much on heating oil as it does on transportation fuels, according to Charlie Niebling, an organizer and member of the Northeast Biomass Thermal Working Group. The Biomass Thermal Energy Council will host an educational webinar on Nov. 4 at 3 p.m. EST, a free event focused on the benefits and challenges of residential biomass heating. The webinar marks the second in a series of five being held by BTEC. 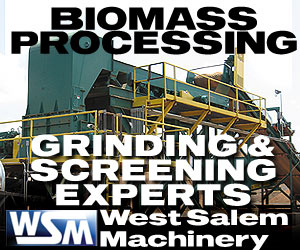 The Biomass Power Association submitted comments contesting a proposed ruling by the Massachusetts Department of Energy Resources on biomass, on the grounds that it will severely handicap the state’s ability to meet its renewable energy goals. Getting it Right: Designing a Sustainable Biomass Supply Chain, a discussion panel at the Southeast Biomass Conference & Trade Show in Atlanta, promises to delve into supply chain issues and logistics, using existing projects as reference points. Duke University and Duke Energy have teamed up to develop a pilot anaerobic digestion project at a hog farm in North Carolina that could serve as a model for other hog operations looking for ways to manage waste and generate their own power. A grower-owned energy cooperative in Oregon has begun harvesting its first crop of high-biomass sorghum, a purpose-grown energy crop that will be used for electricity production. Agri Energy Producers Association will harvest about 1,500 acres. RWE and U.S.-based commodity management firm Gavilon have concluded the first physical supply contract to be priced against Argus’ European industrial wood pellet index. The one-year deal was brokered by Geneva-based Starsupply Commodity Brokers.